I took a trip to Thailand and Laos in early May this year. After 7 days in Chiang Mai, Luang Prabang and Bangkok, I was hooked. My memory goes far beyond the tropical scenery. The minority tribes, the bustling markets, the mouthwatering fruits and snacks, the local way of life…A few days later, I still can’t shake any of it, and I hope I never do. Some cities I love instantly. With just a few people in sight from the airport to our hotel, I realized that Chiang Mai is one of them. We took an afternoon flight, so it got dark when we arrived at Chiang Mai. It had just rained; everything in the night was just refreshing! The evening activities had already unfolded at the night market. Vendors set up their stalls at both sides of the street, leaving middle part for motor vehicles. 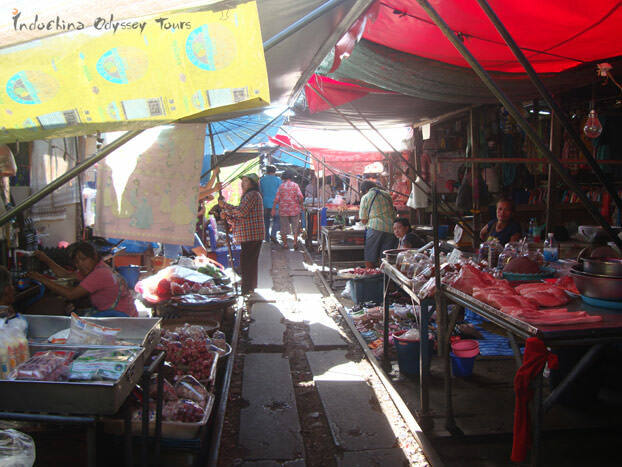 The market was bustling but the street was incredibly clean. The city really knows how to entertain people. Small restaurants and food stalls fork over a wide array of delicacies to leave even a seasoned gourmet spoilt for choice. I drank a bowl of Tom Yum Kung soup to get energy for the next day’s sightseeing. With a full belly, I contentedly retired into my room and fell fast asleep. One of the unique experiences we had during our Chiang Mai trip was a visit to the long neck tribe. It is a local tradition that girls wear a ring weighing 1 kilo around the neck and four limbs at the age of 5, and add another one year by year from 10 years old until they reach the age of 25. The traditional purpose of the rings was to achieve the ideal beauty, an elongated neck. The ring can be added but never be taken away in their whole life. The long-neck women and kids in the village were most gracious about posing for photos (tipping is expected). They make a living by selling various souvenirs, most of which are handmade. Most of the villagers are refugees from Burma, and although living in Thailand, they still use their own language. It had also just rained when we came to Luang Prabang, Laos. May marks the beginning of rainy season in Luang Prabang, which comes to a peak in July and August. This is a city without a traffic light, I was able to soak up a peaceful atmosphere that I couldn't even think of in some big cities. Luang Prabang is small, meaning you can virtually get to every corner by bicycle. We hired one and rode slowly, to experience the quietness of the Buddhist monasteries and the kindness of the local people. The major religion of Luang Prabang is Buddhism. 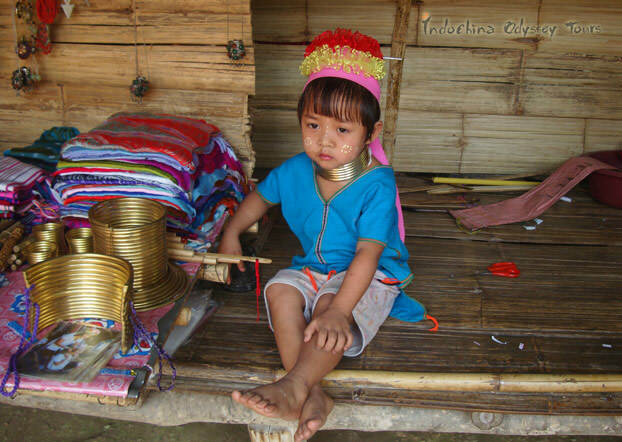 The Laotian people are devout in their religion. Most boys will at one time become a monk, at least for several weeks. They also accumulate merits through almsgiving. Temples have been considered as schools for a long time in Laos. 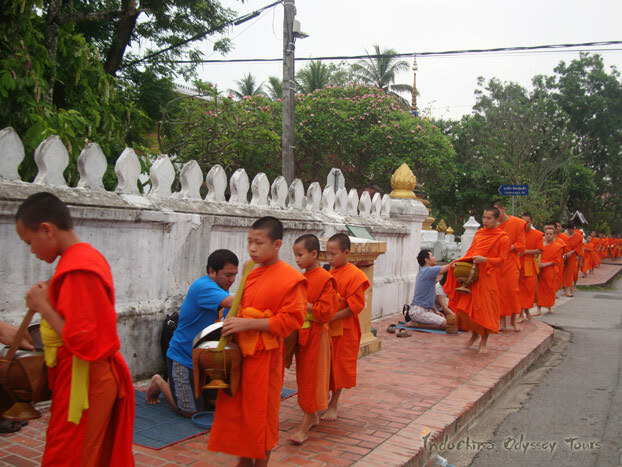 Like most tourists to Laos, I was anxious to watch the alms-giving ceremony. Every morning at sunrise, be it windy or raining, the monks line the streets of Luang Prabang, with bare feet and earthen bowls, to receive alms from pilgrims and tourists. That’s how a day’s food comes. What they receive will be eventually distributed to all people in their monastery. The whole procession was sacred, peaceful and inspiring. Interesting enough, you could easily tell who is a local and who is a tourist. The locals give out bit by bit to the monks so that everyone has a fair share. While tourists often give out too much once and soon find that there are little for others. The sunset views in Luang Prabang are really stunning, no matter seen from the Mount Phousi or on the bank of Mekong River. For shutterbugs, you can climb to the top of mountain Phousi for a wide shot of the whole city, or find a good spot on the bank of Mekong River to shoot the reflection of the sunset on the water or the gliding boats. My feeling is that if you managed to visit them on a good day then you might find every shot is just as amazing as a postcard. Bangkok was our last stop. It is the capital and the biggest city of Thailand, as well as the biggest one in Indochina- Peninsula. It is called the City of Angle, spanning across the Menam River (Chao Phraya River). Crisscrossed canals and busy freights give Bangkok the name "the Venice in Oriental". Coming along with them are what we call "floating markets". 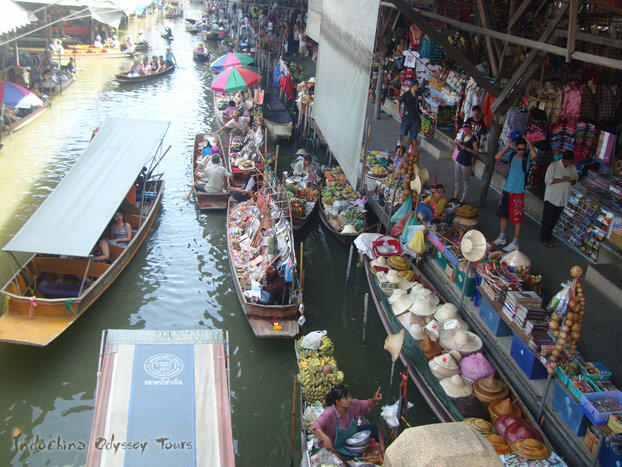 One of the most famous floating markets is the Damnoen Saduak Floating Market. It is some 1.5 hours’ drive from downtown, with a history of over 100 years. It was exhilarating to take a boat cruise through the narrow waterways and pick some fresh tropical fruits. Like any other shopping markets in Bangkok, you never know exactly what you might find! Be sure to take a table along the lazy canal for a cup of iced coffee and a bite of local coconut ice cream! Another remarkable market I’ve traveled to on this trip is the Maeklong Train Market, which is perhaps the world’s most dangerous market. At first, it looked like an ordinary market. Tropical fruits and vegetables were piled, Thai dishes were freshly prepared, and the crowds were moseying around. Then, it happened, as the horns of a train came from a distance, the vendors put on their alerted faces, began to undo their awnings and put away their produce to avoid train collision. The train proceeded to chug straight into the market and rolled past. Within seconds the market was unfolded and thriving once again and you wouldn’t have even known that anything extraordinary had happened just now. 7 days are too short to get enough of the two countries. I am already looking forward to my next trip to dig a bit deeper into the three cities and perhaps to head out to other cities that I haven’t covered in this trip. If my experience has ignited your wanderlust, go and see with your own eyes!